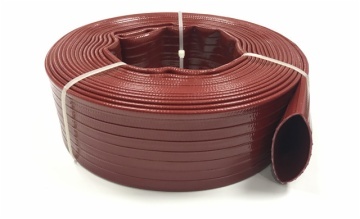 Heavy Duty PVC Layflat Delivery Hose is also called high pressure layflat hose, drainage hose, mining hose, and quarry hose, drag hose etc. Which is an ideal hose designed for liquid delivery in high working pressure. Mainly used for high pressure sprinkling & dewatering, underground mining, light chemicals delivery, light gavel or mud discharge, construction dewatering, mining delivery, marine industries and so on. The tube/cover are flexible and durable PVC, reinforced with 3-ply high tensile polyester yarns, one longitudinal ply and two spiral plies spiral weaved together into knots. Both tube and cover are extruded simultaneously (the reinforced braided jacket is infused after weaving instantly) to obtain excellent bonding. High pressure resistant, working pressure is 6-8bar, lays straight without kinking, abrasion resistant with smooth inner layers which make it a super star in mining and quarry area where friction is happened continuously, resistant to light chemicals, excellent performance on sloped ground, UV resistant, assembled with different types fittings and short length available. This hose can be made with food grade materials, which passed REACH and FDA test, mainly used for food industry.